An artist's interpretation of the GLAST gamma ray observatory in orbit. A NASA space telescope hunting for the most powerfulexplosions in the universe is turning its eye on Earth to hunt for tiny flashesof radiation to determine if they pose a rare, but deadly, threat tohigh-flying commercial airliners. 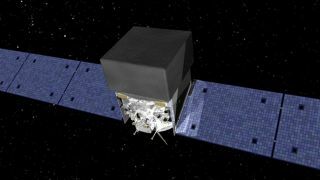 NASA?s Fermi Gamma-Ray Space Telescope has joined thesearch for mysteriousgamma-ray flashes above thunderstorms which are ultra-brief, but could be aconcern for air travelers, researchers said. Just one millisecond blast of the so-called terrestrialgamma-ray flashes (TGFs) could expose passengers and crew aboard a nearby jetairliner to the same level of radiation as 400 chest X-rays, according to a recentstudy. Fermi, which NASA originally launched to seek out gamma-raybursts — immensely powerful explosions in deep space, usually from a dyingstar — joined in the hunt several months ago to possibly uncover more aboutwhen and how TGFs occur around thunderstorms and lightning. To do that, scientists are using one of the telescope?smonitoring sensors. "Fermi-GBM [Gamma-Ray Burst Monitor] has thebroadest energy coverage and highest sensitivity of any instruments that haveobserved, or will observe TGFs," said Jerry Fishman, an astrophysicist atNASA's Marshall Space Flight Center in Huntsville, Ala.
Scientists first discovered the existence of TGFs byaccident, when the Compton Gamma-Ray Observatory detected a flash in 1991. Butthey still don't know if it is lightning that triggers the phenomenon orwhether TGFs provide the quick burst of electrons that may spark a lightningstrike. "The current hypothesis of the origin of TGFs isthat they come from an avalanche of relativistic [high-energy] electronsin the intense electric fields within or above thunderstorms," Fishmantold SPACE.com. The theory fits both observations and computersimulations so far. A football-sized satellite called Firefly is slated totake simultaneous measurements of lightning and TGFs, and may launch this yearor next year. But even that mission dedicated to studying TGFs won't match thesensitivity of Fermi's gamma-ray detector. Still, retooling Fermi?s sensitive monitor to pick upTGFs required some new programming. The instrument typically relies upon adozen low-energy detectors to observe distant cosmicgamma-ray bursts, but it also has two high-energy detectors. Scientists uploaded new software last November that allowsthe instrument to trigger in response to high-energy events such as TGFs,Fishman explained. The change has allowed research teams to find seven times asmany TGF events compared to before, at a rate of about two per week. Fermi's GBM timing accuracy can also pinpoint a flash towithin two microseconds, or two one-millionths of a second. That may help theFirefly mission pinpoint whether lightning or TGFs strike first, so to speak. For now, the TGFs appear completely unrelated to thecosmic gamma-ray cousins that the Fermi Gamma-Ray Space Telescope set out tostudy. But it's a mystery closer to home that has proven just as intriguing asany astrophysicspuzzle. "Their spectrum [energy spread] is unlike anythingever seen from cosmic gamma-ray objects," Fishman said.